One key to successfully finding gold is to be a little more ambitious than everyone else. Folks have been prospecting the easily accessible areas for a long time now, and the pickin’s are getting awfully slim in some places that were once very rich with gold. Putting in some extra legwork by hiking into more remote gold country is one way to increase the amount of gold that you are finding. There are countless areas that are gold-bearing that simply require you to do some hiking to access them. Sometimes you might be off-trail and have to do a bit of bushwacking to get to your destination, but will usually pay off. To do this kind of prospecting you need to go prepared, but at the same time you will be carrying everything with you on your back, so you need to be selective. Below are some basic supplies that should be included in a good backcountry prospecting kit. Most importantly, you need a good backpack that is large enough to carry all of the supplies below yet comfortable enough to wear on long hikes. Compile all of your equipment and find one that seems to accommodate all of your gear. The gold pan is the most important piece of equipment for any prospector. Don’t get one that is too large. A simple 12” or 14” pan is plenty, and will work well for the backcountry prospector. Some might consider this optional, but I really like classifier to help speed up the efficiency of the panning process by separating out the larger rocks. Plus, they stack easily on top of your gold pan, so very little extra space is taken up by including one. A standard rock pick is a handy tool to have with you. When prospecting in remote areas, you will want to use it to break apart rocks to access rich gold-bearing gravel deep down in cracks and crevices of bedrock. The point end will help you open up the openings of cracks, and the flat end will give you a hammer to use other pry tools. A small pry bar is another great tool for getting down into bedrock cracks. You don’t need one that is too large or heavy, just enough to get the job done. Crevice tools, similar to the pry bar, are simply used to help you access the richest gold bearing gravels possible, which are generally located deep in the bedrock cracks. When you have hiked into a remote area, you do not have the benefit of larger equipment like suction dredges for example, so you have to get the best gravels possible using limited equipment. A variety of small crevicing tools will do the job. Another tool that weighs basically nothing yet will speed up your recovery of gold. The snuffer bottle helps you to separate out the gold from the black sands. Tweezers go along with your snuffer bottle for small gold recovery. 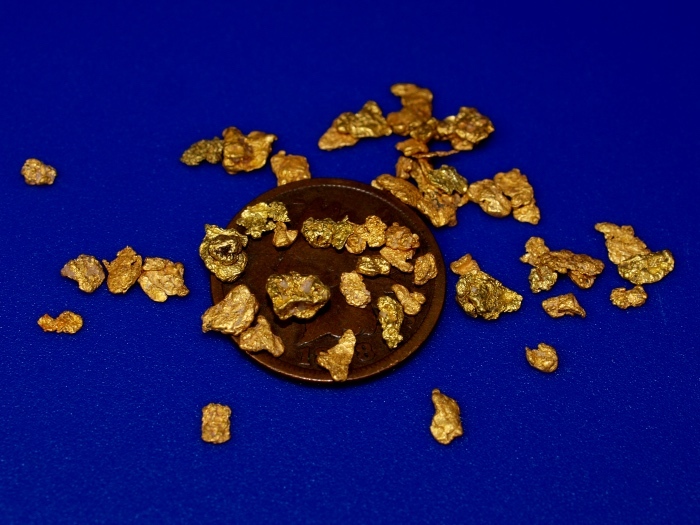 If you are lucky enough to find a small picker or chunky flake of gold, it’s a simple matter of grabbing it with your tweezers and adding it to your gold bottle. A small magnet is also handy for separating black sands from your gold. You can find very strong magnets that are very small and lightweight that will do a fine job at this task. A small jeweler’s loupe can come in handy for examining potential gold or other specimens that you encounter in the field. They only cost a few dollars and weigh very little. A good generic piece of equipment that can come in handy for a prospector who is backpacking into remote areas is a good multi-tool. You can wear it on your belt, and the various gadgets can come in handy for countless uses for prospecting or just general needs. A sluice box may be more than you want to carry when you first start exploring a new area, but if the location seems to be productive then a small sluice box may be worth packing in. This will allow you to process much more material than you could with just a gold pan by itself. If you find a rich area that is several miles from the nearest road or trail, you will need to evaluate the best way to mine it. The gear described above is a perfect collection of gear that will get you set up to find gold, but once some good “color” is found, scaling your mining operation up is always the end goal. Of course this is no easy task. Don’t make the mistake of getting too ambitious too soon. Take your time in the sampling process to make sure the area that you have located is worth the added time and effort you will need to invest to bring in better equipment. If you are fortunate enough to find a rich gold deposit far off the beaten path, give careful consideration to which type of gear will work best for your needs. Perhaps what you need is a good metal detector to pick gold nuggets from the bedrock. Possibly a larger sluice box and a standard shovel are worth packing in. It’s always a good idea to scale-up your operation if you are get into good gold, but start off small so you can be more mobile and sample various areas. 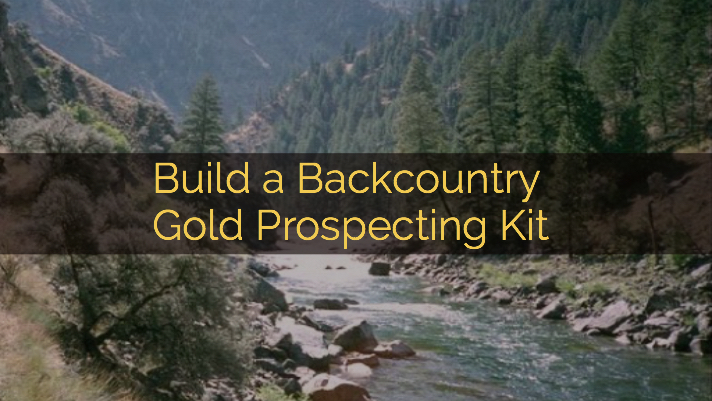 Compile a simple gold prospecting kit with the gear mentioned above, and you will be set to explore the more remote gold country. Of course, food, water, and some first aid equipment should always be included as well.